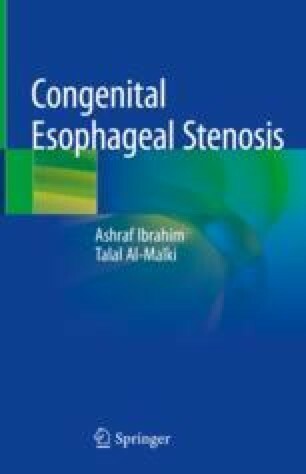 In humans, tracheobronchial remnants (TBR) may be very common in esophageal atresia/tracheoesophageal fistula (EA/TEF) that may lead to stenosis and abnormal motility after successful anastomosis. A lack of normal muscle coat at the fistulous end may cause esophageal dysmotility. TBR in the repaired esophagus as well as a disorganized muscle coat may be part of the transition from the fistula to a normal esophagus. The extent of this TBR is variable. Loss of normal esophageal function may be due to abnormal numbers of glands and ducts and presence of abnormal mucin production. In animals and in humans, the TBR may involve the whole lower esophagus including the anastomotic site. The muscles are more likely to be distorted by TBR in the lower pouch and by fibrosis in the upper pouch in cases of EA. However, degeneration of SMCs and deposition of abundant extracellular collagen fibers are prominent pathological changes in the LEP of EA/TEF. These changes might contribute to the pathogenesis of esophageal dysmotility in patients who have survived EA/TEF. There are abnormal intrinsic dysplasia of myenteric nerve plexus and an imbalanced release of neurotransmitters. There are lower interstitial cells of Cajal (ICC) density and delayed maturation in EA/TEF cases in favor for the pathogenesis of esophageal dysmotility. In humans, there was a lower fraction of neural tissue in the layer of the Auerbach plexus in the atretic esophagus compared with controls which was more evident in the lower esophagus. There are marked hypoganglionosis and deficient distribution of immature ganglion cells and some nerve fibers in the proximal end of EA.